For spectacular and all-inclusive Tryon wedding venues, look no further than The Horse Shoe Farm, located in nearby Hendersonville. 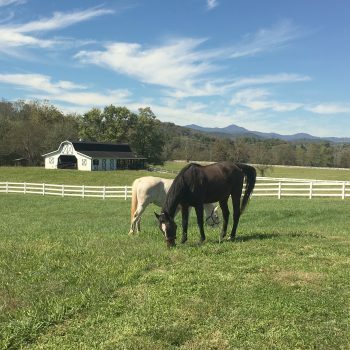 Situated in the heart of the Southern Appalachians, our expansive 85 acres of pastureland is bordered by majestic mountain vistas and a historic river. In addition to our impressive scenery, we also offer all-inclusive wedding packages, three available indoor event venues, and much more. For the ultimate outdoor wedding, exchange your nuptials on our pristine property, which features lush green fields cut by crisp, clean equestrian fencing. Spectacular sunsets with bathe your late afternoon ceremonies in shades of purples, oranges and pinks, adding a romantic ambiance that money can’t buy. Our attentive staff can assist in selecting the perfect place to say your “I dos.” We can also help in coordinating the delivery and pick-up of rental equipment, like tables, chairs and tents. The Big Sky Barn has 6,000 square feet of space to play with. Add your own personal touch to this venue, and transform it into your perfect ceremony space. But if you need a little more room, rent The Sunset Barn. The 6,5000-square-foot building also features a partition, allowing you to split the space in two. Host your ceremony on one half, and seamlessly transition to the reception within a matter of minutes. If the weather does cooperate, open the large retractable doors and let the party spill out onto the concrete patio. No other Tryon wedding venues feature anything like The Stable House, which is the most iconic building on our property. The “barndomonium” features a working equestrian stable on the first floor. Rough-hewn wooden planks flank the ceiling and walls of the catwalk, creating a warm, rustic feeling. 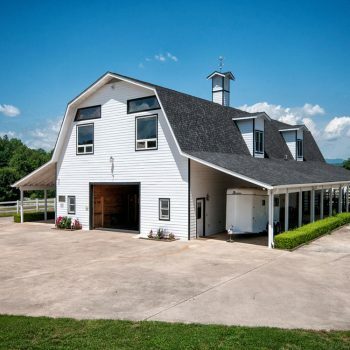 In addition to fourteen spacious stalls, the barn features a feed room, tack room and wash stall. On the second floor, we’ve restored the loft into a luxury rental. Five bedrooms, three bedrooms and an open living area feature eclectic decor and comfortable furnishings. This venue is perfect for those seeking an authentic, but modern, barn wedding. In addition to our event venues, couples have access to The Silo Cookhouse, the farm’s residential restaurant. Feed your soul and your guests by taking advantage of our available catering services. No Tryon wedding venues offer the same spacious event venues, incredible scenery and all-inclusive amenities like The Horse Shoe Farm. Browse our wedding brochure for more information on our wedding packages, and let us help you plan the farm wedding of your dreams!